It’s a peculiar thing, the fact that a vast majority of humans are incredibly more proficient at everyday tasks with one side of their body. Being able to do everyday, essential things, but being limited to 50 percent of your body to do those things, in a non-ridiculous manner, makes you wonder how we got this far. Of the entire human race, left-handed folks only make up roughly 10 percent of the population. There are several evolutionary reasons for this as how it links to your brain, but it makes for an interesting disparity in society, and certainly an occasional hindrance for those among that 10 percent. Thus, requiring left-handed specific products at times. Nowhere in our world is handedness more scrutinized than in sports. Lefties make up 10 percent of the population, but oddly 0 percent of NFL Quarterbacks are left-handed, along with 0 percent of baseball catchers, second basemen, third basemen and shortstops. In baseball, there are fairly good reasons for that given the makeup of a baseball diamond, but the disproportionate number of left-handed pitchers and first base/outfield hitters actually brings the percentage up to 25 percent of Major League Baseball being left-handed. For the same reason there’s much more than 10 percent left-handed hitters in baseball, there’s much more than 10 percent left-handers in hockey. It’s actually 63 percent, to be exact. So while it’s really debatable if left-handed hockey players should actually be considered left-handed, it’s undeniable that a vast majority of hockey players hold a stick the way a left-handed person conventionally would. Despite this disparity, hockey teams try to have an equal balance of wings and defensemen who are left- and right-handed, and there are many reasons for that. While it may not seem to be important to have certain players shooting a certain way, in the ultra-competitive and ultra-thin margin for error in the NHL, it’s more important than one may think. How? Well, I’d love to explain it, but I’ll need my rod hockey table to do so. Let’s start with the forwards. 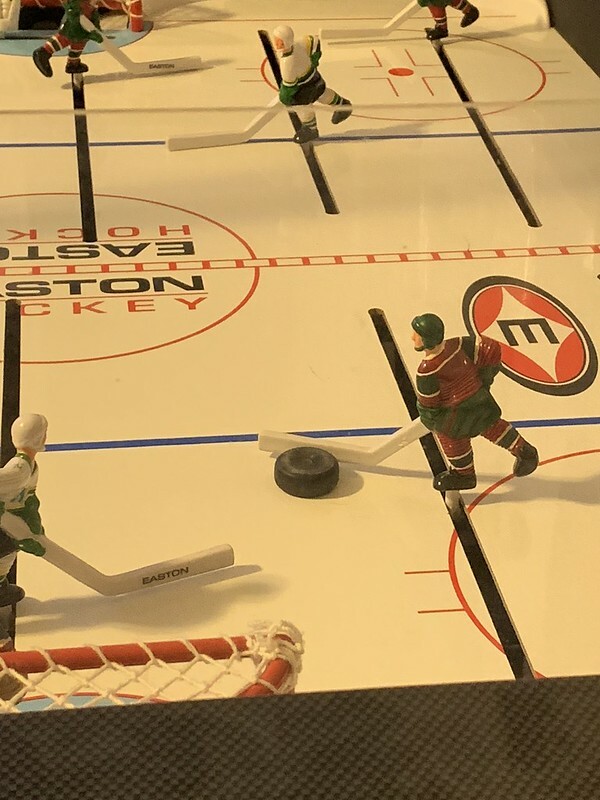 Luckily for this exercise, all of these rod hockey players are molded as left-handed, because it’s easier to only mold one player and even Easton gets the joke. Here we see a left-handed right wing with the puck in the offensive zone on the right side of the ice. His stick is facing in towards the middle of the ice, which is handy, since that means he can face the goaltender and shoot on his forehand if he gets a pass through the middle of the zone, which are passes that are advantageous to get, since it requires the defense and the goalie to adjust to the new side, opening up shooting lanes and the goalie’s pads. That poor red and green defender doesn’t stand a chance. It also helps forwards in the defensive zone, when they’re facing their man on the point in their own zone. If they can steal or get the puck, their stick is already in the middle of the ice, to hit a streaking teammate leaving the zone, possibly splitting the defenders for an odd-man rush or breakaway. Now here’s a player on the flip side, a lefty playing left wing on the left side of the ice, receiving that very same pass across the middle. As you can see, he’s now on his backhand. While this is a tad inaccurate and comical because very few players would receive that pass like this, it illustrates the problem. If that player is turned around to take the pass on his forehand, with his stick facing the boards and not the center of the ice, that pass has to travel that much further, and one-timing that pass (shooting the puck without stopping it first) is nearly impossible because it crosses your body behind your back. Furthermore, his passes to the right side of the ice are now limited, as he would have to turn around to pass behind him to a point man using his forehand, whereas a right-handed player would only have to angle his upper body that direction. Now, we see forwards playing on their ‘off-hand’ on occasion, and it does have a few advantages. First off, for our left-handed friend on the left side, he can make passes around the boards to someone behind the net more easily, and he can guard the puck with his body while still facing the net as well. These are trade-offs that are made when you build lines in this matter. Defensemen don’t necessarily have the same trade-off, so it becomes extra important that they do not play on their off side. Here we see a left-handed defender in his own zone with the puck, looking to break out — as you can tell by his determined expression. Because most puck play in your own zone tends to be along with boards, he has the puck along the boards, but is able to look up the ice and deliver a strong forehand pass from where he is without adjusting his body. The same principle applies to the offensive zone, where this same defender will have his stick facing the boards, because most clearing attempts are going to come along the boards, as defenders try to avoid throwing the puck across the middle of the ice, which is a big no-no for obvious reasons. The attacking defenseman can stop the puck on his forehand, and fire back into the zone, or pass it virtually anywhere with his chest facing the zone, and do all of that quickly. Conversely, here’s the poor sap that’s left-handed but his playing right side defense. If he retrieves the puck along the boards, he needs to turn around to face up ice. 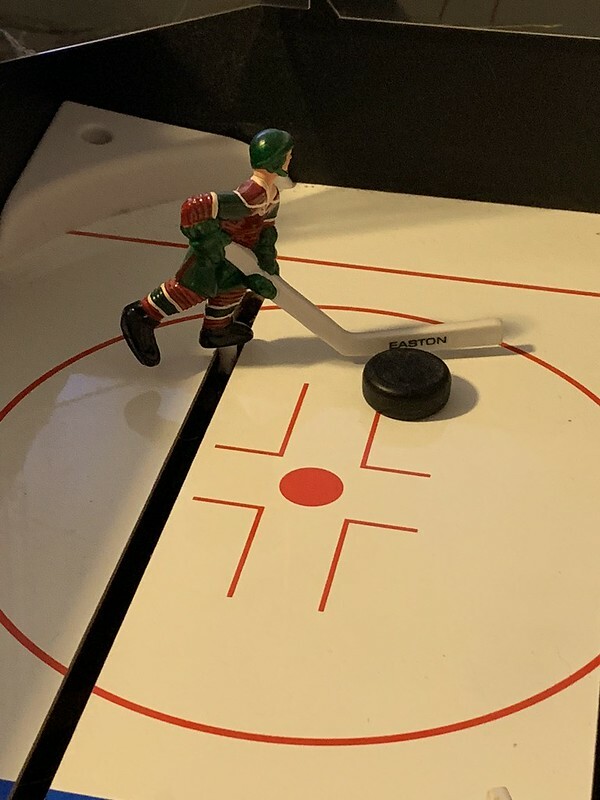 Even when he does have the puck in this position, his stick is now facing the middle of the ice to deliver one of those wonderful stretch passes needed to clear the zone. 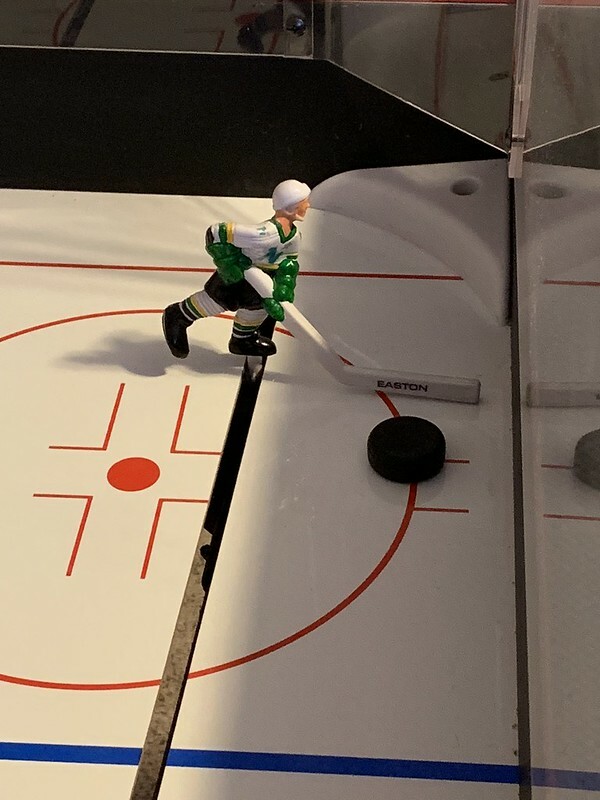 It’s now harder for him to use the boards, as he’s a few feet off of them, so he’ll need to pass more towards to the middle of the ice, or execute an absolutely perfect bank shot off the boards to his right to hit a forward in the neutral zone. He’s also unable to protect the puck against the boards with his body while still facing up ice. As for him in the offensive zone, his stick is facing the center of the ice, which is great for the occasional clearing attempt that goes across the middle, but as I mentioned before, those aren’t as plentiful as passes within 3-to-5 feet from the boards. While he can one time passes from his partner with ease, that doesn’t really happen much at even strength, and having his back to the entire offensive zone in order to stop a puck along the boards negates all of those positives. So to recap, forwards should ideally play the opposite of their hand as we think of the positional vernacular righties play left wing, lefties play right wing. Defensemen need to play their handed side, lefties on the left side, righties on the right side. Why is this all so important? Well, let’s take a look at the current Minnesota Wild roster. Looking at this, you can see the issues the Wild may be running into on occasion. I should note that Luke Kunin, who is currently assigned to Iowa, is right-handed, as is the injured Matt Dumba. Also notice that their one bonafide top-six right-hander is Charlie Coyle, who has spent much time at center this season. 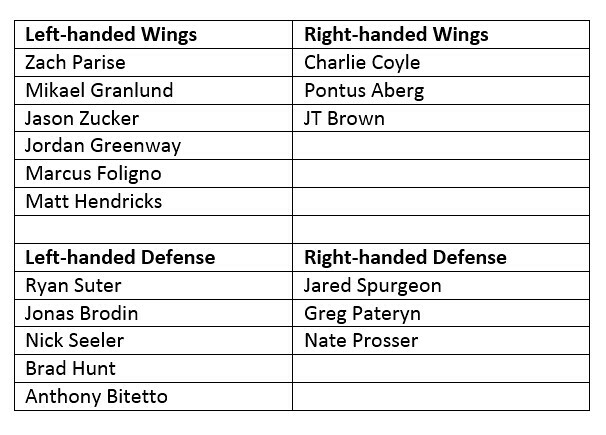 All in all, the Wild roster excluding goalies is just 33 percent right-handed, including the players above and center Eric Fehr, who is returning soon. The Wild have definitely felt this pinch recently, especially after Dumba’s injury, and especially on the power play, where the lack of a big right-handed shot lurking on the left side had them drop from the seventh-best power play in the league at the time to 24th since his injury. 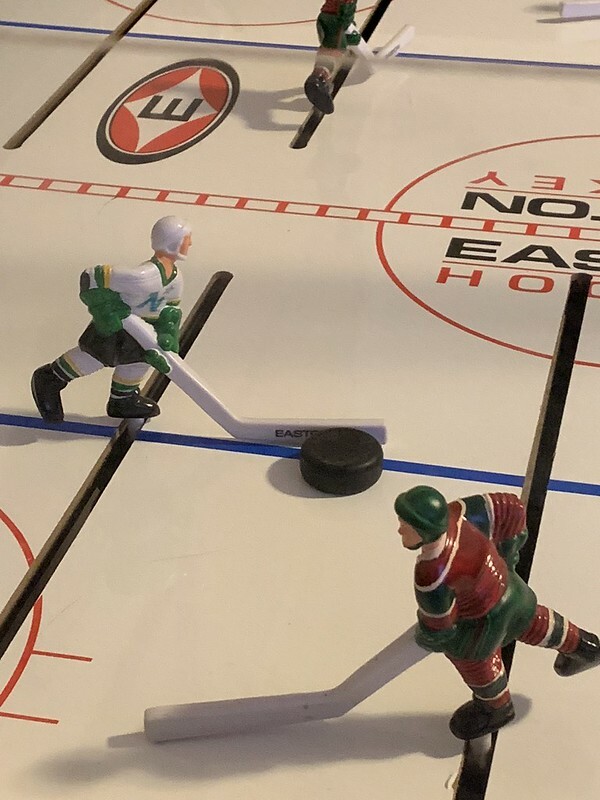 They’ve also run into issues after the acquisition of Brad Hunt, pairing him with fellow lefty Jonas Brodin, but having them switch sides in their first game to try to make things work. It’s probably not a knock on Brodin, but Ryan Suter has also publicly bristled at pairing with him, likely not because of their similar styles of play, but rather their handedness. The dearly departed Nino Niederreiter did happen to be left-handed, but so is his replacement, Victor Rask. However Rask is a center, where that’s pretty irrelevant. You can see why the Pontus Aberg trade made sense for the Wild, adding a much-needed right-handed wing. On the flip side, the recent claim of Anthony Bitetto makes even less sense because of handedness, especially after the previous acquisition of Hunt. A lot has been made of Paul Fenton opening the floodgates on trades recently, and tweaking this team into a contender. It seemed he was conscious of the handedness issue the Wild have by trading for Aberg, but since then he’s acquired four left-handed players, including Wednesday’s trade for AHLer depth defenseman Michael Kapla. If Fenton is to make tweaks to the Wild, he may be wise to prioritize handedness with his wings and defensemen. He was saddled with a very left-handed roster, and it’s likely hurt this team more than most would think, and he needs to limit that damage. If the Wild are to improve through acquisitions, Fenton may want to look for the right hands.